So Yat Wai won a Buy-1, Get-1 Free 7-night, 5-dive package in with Manta Ray Bay & Yap Divers! 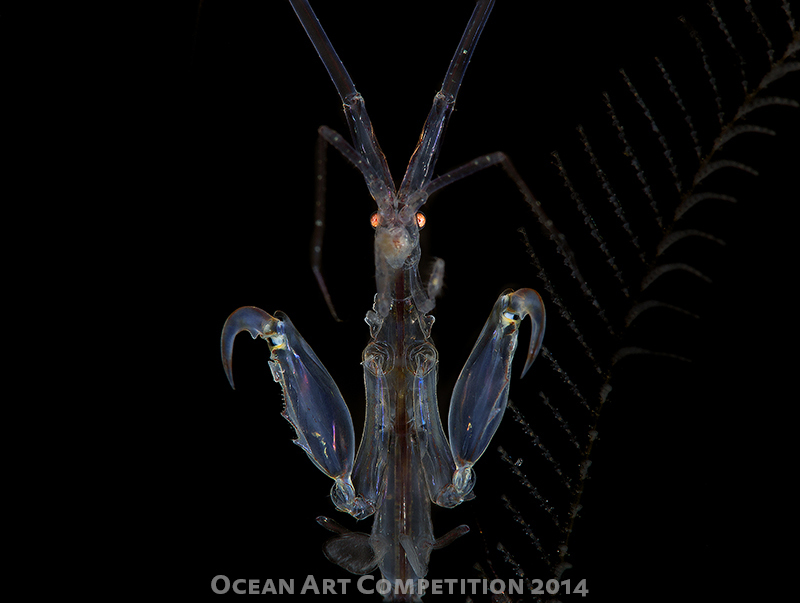 The story: I had planned to take a skeleton shrimp face-on portrait at the start of my Anilao trip. This idea was inspired by Todd Bretl's 4th place Macro Category Ocean Art Contest 2013 photo. Finally, I had spent two complete dives and around 2 hours on this critter. It keep moving and spinning around the hydroid and made my right arm cramping. High F number could maximise the chance to keep both eyes and claws in focus. I took the shot once both eyes had sharp reflex of my focus light - I didn't waste time to check the camera preview since this active guy rarely faced my lens and kept turning.